Meet MJ Kinman. 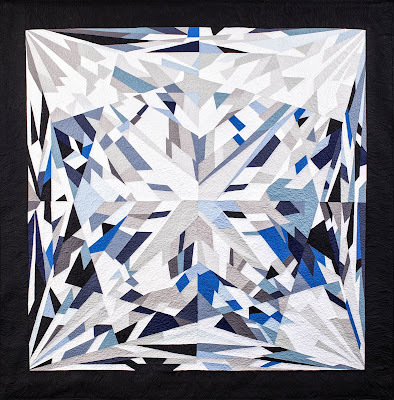 This former project manager turned full-time textile artist transforms quilting cotton (like our Painter’s Palette Solids!) into dynamic, faceted gemstones that look so real, you’ll want to reach out and touch them. She used Painter’s Palette Solids in the Elizabeth Diamond (shown below), as well as in her Birthstone Series, which we'll be featuring later this week. We asked MJ to share her story with us. MJ: I love sparkling gemstones. When I was a little girl, my mom bought me a Snow White and the Seven Dwarfs record. On the cover was a cart of gemstones (and seven dwarfs). I still remember it. In the early 90s, I received a mailer with a 12-facet diamond on it. I was intrigued—it was all straight lines—and I thought that there had to be a way to make this into a quilt. I started researching facted gemstones and different quilting techniques. Q. How did you find your technique? MJ: I looked at work by Ruth McDowell, Cynthia England, Jane Hall and Dixie Haywood and started using freezer paper to make foundation pieced work. I was hooked! I made my first diamond quilt about seven years after receiving the mailer with the gem on it. Q. 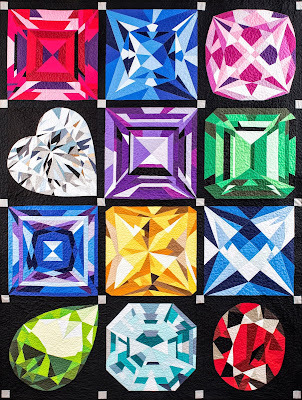 What is it that makes these gemstone quilts so realistic? MJ: When you’re looking at gemstones, the important thing is the value contrast. That’s what creates the sparkle. With my gemstones, I really wanted to achieve the high value contrast because it allows the drama to come out. Q. How do you choose the gemstones that you create in fabric? MJ: I’m always on the lookout for images of dramatic stones. I study the image, and try to figure out what the cut is. Within the facets, I try to see how light is refracted and selected. I draft to scale. I have a small mock-up and then translate it into a larger one. I identify the key fabrics that will allow the stone to sparkle without breaking the bank (by having so many different fabrics). Q. Tell us about the Elizabeth diamond. MJ: It’s done in all blues. I’m also going to make it in yellows, like the citrine, and a pink diamond as well. If you look closely, it’s nothing more than a four-patch—it has four quadrants and each quadrant is made up of sections. It has about 16 fabrics in it. Q. How do you decide which fabrics to place where in your gemstones? MJ: It’s partly based on the photo of the gemstone, partly based on my gut, and partly based on 20 years of making these. I study the gemstone very closely, and try to pick exactly the right colors for the right places, and sometimes I get it right. Sometimes it doesn’t sparkle like you want it to, so you try again. The first diamond I did laid there like a lump of coal. I revamped it and tried again until it sparkled like I wanted it to. Q. You’ve worked with so many Painter’s Palette Solids. Do you have a favorite color? MJ: Every single one of them was picked for a purpose—for its glow, its relationship to the others around it; of course you have to have the light lights and dark darks. I would say the go-to color in every single one is ebony. It’s the background that makes the gemstones pop. Visit MJ's website to see and read more. See MJ's Birthstone Series here. All of the gemstones are absolutely stunning! Why Otters Are the New Hedgehogs! Ring Ring FREE Quilt Pattern!